Do you know that our God is a faithful God? He has promised, and He shall never fail. We must pass through the wilderness before entering into the promised land. Enduring the wilderness, the dry season, the loneliness is not always easy but it is most definitely worth it. The promised land is a place of greatness. We cannot reach that place of greatness unless we are also transformed into greatness. There is long suffering before there is victory. There is the cross before there is resurrection. Do not despise the wilderness for in the wilderness He prepares His children for a great transformation! Endure the wilderness, wait on Him in the wilderness, seek His face in the wilderness! He says He rewards those who diligently seek Him. Are we willing to diligently seek Him even in the wilderness? We must look past the wilderness and keep our eyes fixed on God. For He who is able to see us through in the wilderness, is definitely able to take us to our promised land. Thank You Lord for preparing me in the wilderness and bringing me into Your promised land. How can I not trust and believe you no matter what! You have delivered me from sin. Purified me in the wilderness, and now You are bringing me into Your promised land. I trust and believe You Lord no matter what! 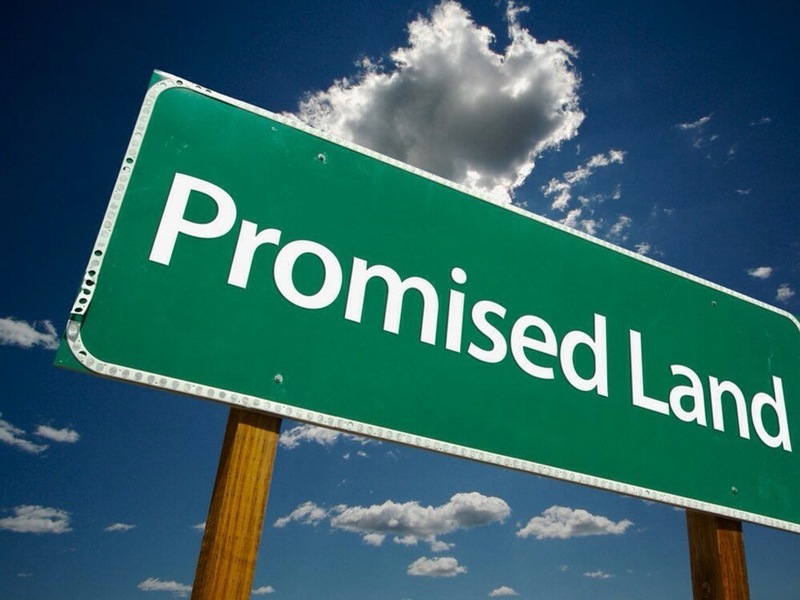 The promised land is His perfect predestined will for your life. In every situation never stop keeping your eyes fixed on God. Your promised land is not far from the wilderness, but if you divert your attention from God then you will delay your arrival there. Keep your eyes fixed on Me and allow Me to lead you. For you are not far off from where I want you to be. I Am Your Lord and King. Just believe Me my daughter, my son. For you are so close to your promised land. I that delivered you my faithful servant shall surely reward you with My promises. I have seen your faithfulness and I shall reward you accordingly. I have seen, and I shall surely reward you. But when you get to the land that I promised you, you MUST REMEMBER THE LORD YOUR GOD who brought you there. How many times have people denied Christ once they have entered their promised land? The amounts of people who have denied Christ being the reason and the source of their success are innumerable. They have allowed the milk and the honey to flow through their hearts so much so that they have allowed it to rule over every part of their being. They have put the milk and the honey before God, and have made made them idols. And Now they worship milk and honey instead of reverently fearing and worshipping The Lord their God whom brought them into their promised land. Putting milk and honey before God is the same as putting the flesh before God. The flesh disallows The Holy Spirit to flow through us and rule over our hearts and minds. Remember that milk and honey are the promises of God and every promise of God is good, but if we disobey, and reject God once we enter the promised land then we have allowed satan to change that good into bad. For instance Adam and Eve were in the promised land The Garden of Eden until they disobeyed God which led them into eating the forbidden fruit, the milk and honey of satan, which not only cast them out of their promised land, but out of the presence of God! Never eat of the fruit of satan! Never drink the milk and eat the honey of satan. For the milk and honey of satan are counterfeits, set out to destroy us. The milk and honey of satan seems pleasing to the eye, it seems sweet but really it is bitter it is poisonous. It may seem pleasing to the eye just like it did to Eve but really it destroys the soul. And satan will come, satan will try to tempt us with his milk and honey just like he tried to tempt Jesus! You see why I say the wilderness is not a bad place to be it is a place of preparation. The Holy Spirit leads us there. He prepares us in the wilderness and makes us ready for the promised land. Can you see the power of the Holy Spirit! He sustains and He strengthens! Like Jesus we must rebuke satan with The Word! For we do not live by bread alone, we do not live by milk and honey alone, we do not live by the flesh alone but by His Word, His Spirit and His Truth! In the promised land we must never cease from eating of His Word. For His Word brings total satisfaction. His Word never lets us go hungry nor does His Word lets us go thirsty. He fills us up, He causes an overflow, and He quenches our thirst! He is The Bread of Life, and The Fountain that never runs dry. So now that we are in our promised land who can we honestly say rules over us is it God, or is it satan? How can we identify who rules over us? Well if we never commune with God in the promised land if we never eat of His Word, if we never acknowledge His presence, and if we choose to do as our flesh desires then we have allowed satan to rule, and we have chosen to eat of his milk and honey. So what exactly is the milk and honey of satan? The milk and honey of satan are the pleasures of the world and not of the promises of God, the milk and honey of satan are the pleasures of sin of the flesh. We should be careful of idolising the milk and honey of this world. Lord forgive us for believing that it’s ok to indulge in the milk and honey of this world. Lord forgive us for accepting the milk and honey of this world. Lord forgive us for trying to combine the milk and honey of satan with the milk and honey of Your living Word. Lord forgive us for even admiring the milk and honey of satan! Forgive us Lord for idolising the things and the people that do not honour Your Name. Forgive us Lord for bringing the milk and honey of satan into our churches and into our worship! The milk and honey of God is the fruits of His Spirit. Let us keep feeding The Spirit with His Word with His milk and honey, and let us stop feeding the flesh with the milk and honey of satan which is sin. Some of us have fed our flesh with sin way too much its getting out of control! It’s time to shed some weight! It’s time to fast and pray! We become conceited and envious when we idolise the things which are not of God. WATCH be careful, observe, restrain from, and PRAY. Seek Him first in the promised land and every thing that is good, the blessings, all that is good shall be added unto us. This morning God is saying yes I will take you to the land in which I have promised you but when you get there do not forget Me. Do not forget what I The Lord did for you in the wilderness. Do not forget that humbling season. For if you forget My ways and if you forget My statutes, and if you forget My Word, you shall surely end up in Babylon. We do not want to go back to Egypt we do not want to be cast out of His presence, we do not want to taste the promised land only to be exiled into Babylon, into hell. Do not enter the promised land prematurely. Enter the promised land when I tell you to enter. For it is I who matures you and makes you ready for the promises in which I The Lord has prepared for you, but you have got to trust Me. You have got to trust My Word in the wilderness, the more your trust Me in the wilderness the closer you will get to My promises. Do not forget Me, and I will always remember You. When you enter the promised land remember just like in the wilderness that it is never about you, but it is always about Him our Lord and King Jesus. We must obey The Lord.